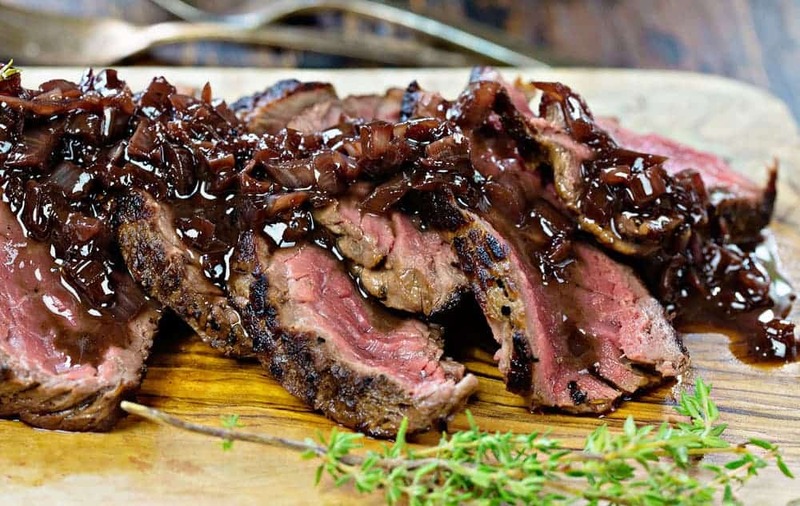 Steak with red wine reduction is the perfect combination of sweet and savory. 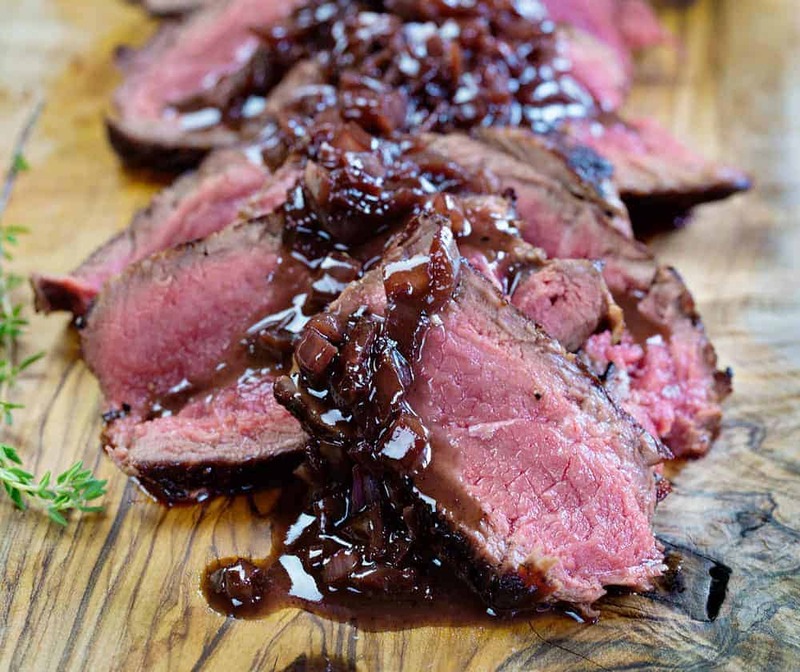 A simple and delicious red wine reduction sends the natural flavors of the steak over the top! Make sure to check out our Marinated Steak Bites too! Sometimes you just want a nice juicy steak. If that is you, this is the dish for you. 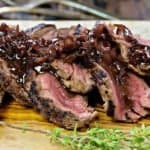 We take a beautifully marbled top sirloin steak (insert ribeye or even filet mignon here depending on what kind of steak you prefer) and top it with a mouthwatering red wine reduction. It sounds like something you would order off of a fancy steakhouse menu, but it really is simple to make at home. With a few ingredients, you can impress the masses! After the sweet shallots and the wine cook down in the reduction, you are left with a sweet and savory sauce. What is the best wine to cook with? A general rule of thumb here is to only cook with wine that you would actually drink. If you are not a wine drinker because you choose not to drink alcohol, fast forward to the next section where I tell you what happens to the alcohol content when the wine is heated. If you don’t like the flavor of wine, then I would suggest trying more! Kidding, of course. For those of you who like to pair wine with a good meal, or just enjoy the occasional glass of wine, keep on reading! This recipe calls for red wine. The reason red wine typically pairs well with red meat is that red wine tends to be higher in tannins. Tannins are a textural element in wine and tend to give off a bit of a dry taste. The dryness is complementary to the rich fattiness in red meat. A sweet red will still work in this recipe. At the end of the day, it’s simply a matter of picking a wine that you know you will like. Also, I would avoid using the wines they sell at the grocery store or “cooking wines”. They are generally filled with salt and preservatives. These additives will not get you the flavor you are trying to achieve with this dish. What happens when you cook wine? When wine is heated, most of the alcohol evaporates within a few minutes. The longer it cooks, the more the alcohol cooks out of the dish. If you are worried about serving a dish with alcohol, you could simply adjust the temperature to low and allow the reduction to simmer longer. The sulfites in wine, which some people are allergic to, also evaporate on cooking. The single goal of using wine in cooking is to enhance the flavor of the dish with the concentrated flavor of the wine. One of the best things about this savory and sweet red wine reduction sauce is that you can use it in a few different ways. For this recipe, we used it on a top sirloin steak. I have also served this on filet mignon and ribeye. You could also serve it over lamb if that is something you like! Another variation of this is to add mushrooms. I love a good earthy mushroom with my steak. Adding mushrooms definitely changes the flavor of this reduction. I would adjust the recipe a bit. Cook the mushrooms first (about 10 minutes) to cook out most of their moisture and then follow the recipe as written. We like to serve the red wine reduction sauce over medium rare steak, but this is ultimately a personal preference. If you like your steak more well done, you will need to adjust the cooking times accordingly. Cooking times will also vary based on the cut, thickness, and temperature of the steak. This was based on a fairly thick cut of top sirloin (about an inch and a half). 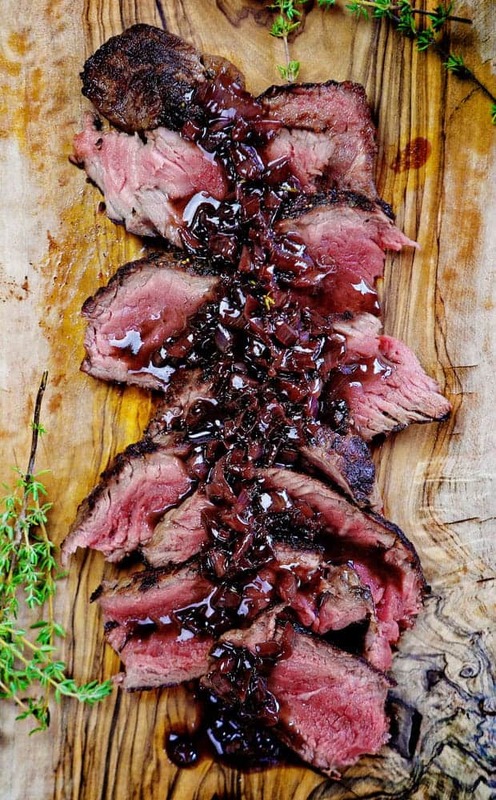 What to serve with Steak with Red Wine Reduction? Confession, sometimes I will make this as an appetizer. I will make it and just let people pick off the plate. Sometimes, I make this as a meal for myself. When I do that, some ideas for pairing are restaurant style smashed potatoes, browned butter Brussel sprouts or garlic potato wedges. Looking for more steak recipes? Try out this awesome marinated steak bites recipe! Pat steak with a paper towel to remove excess moisture. Add steak, two springs of thyme and 2 tablespoons butter and cook until well browned (about 3-5 minutes). Flip steak and repeat with the opposite side. Using tongs, sear the sides of the steak. Transfer to plate and tent loosely with foil. Add 1 tablespoon of butter to the empty skillet and melt over medium-high heat. Add wine and brown sugar, simmer until reduced, approximately 3 minutes. Add broth and simmer until the mixture is reduced by 1/2, approximately 5 minutes. Add in butter and minced thyme, mix well and set aside. Slice steak into 1/4 inch slices. Place on serving dish and cover with red wine sauce. Every kitchen simply must have a good skillet! I love my Staub Skillet. They come with a lifetime warranty so they are worth the price tag in my opinion. Also, they are so easy to clean and care for. Did you make Steak with Red Wine Reduction?